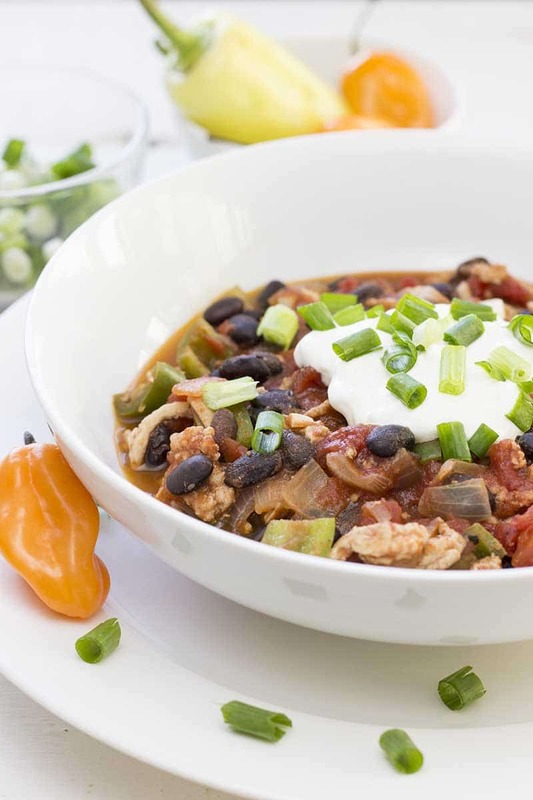 This Simple Turkey Chili is loaded with protein (25 grams per serving!) and a satisfying spice thanks to ingredients like jalapeño and red chili. If you’re short on time, don’t worry—you’ll be able to make this healthy turkey chili recipe in about 30 minutes. 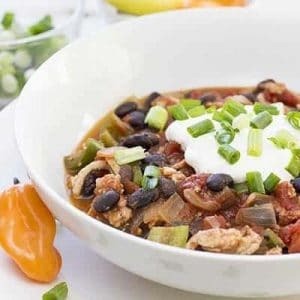 I like to call this recipe “Simple Turkey Chili” because it’s easy to make and comes together in no time (around 30 minutes), but when you taste it, you’ll realize the word “simple” doesn’t do the flavor justice! Step 1 – Chop Jalapeño, red chili, onion and garlic and sauté on a hot pan for 3-4 minutes until the onions become translucent. Step 2 – Add ground turkey to the pan and cook it for another 5 minutes. I like to use 93% lean ground turkey to keep the calories down, but the less lean ground turkey actually has even more flavor so you can go for that if you like. Step 3 – Add tomatoes, black beans, chicken stock (or just a bouillon cube), and spices and let it simmer for 10-15 minutes. I typically just use paprika and black pepper for spices, but you can also add more chili powder to adjust the hotness. Ground cumin is also a classic chili spice but I personally don’t like it that much. Step 4 – Serve with chopped green onion and sour cream on top. The green onions are optional but you really need the sour cream. It adds a freshness that really elevates that taste of the turkey chili. How healthy is this chili? 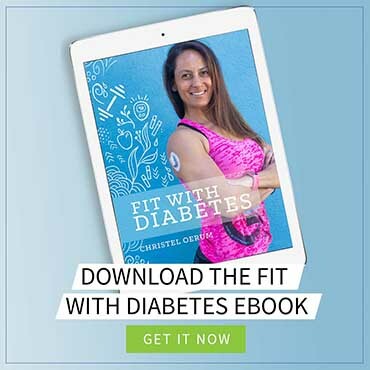 Each serving contains only 232 calories and packs 25 grams of protein and 17 grams of mostly low-glycemic carbs. All of it from healthy, minimally processed ingredients. 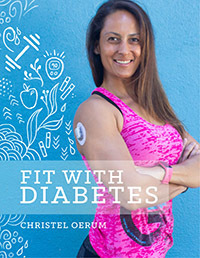 I don’t like the term “diabetic chili”, but this recipe has the perfect nutrients for a healthy and diabetes-friendly recipe. You can even take out most of the carbs by limiting the beans if you follow a very low-carb diet. 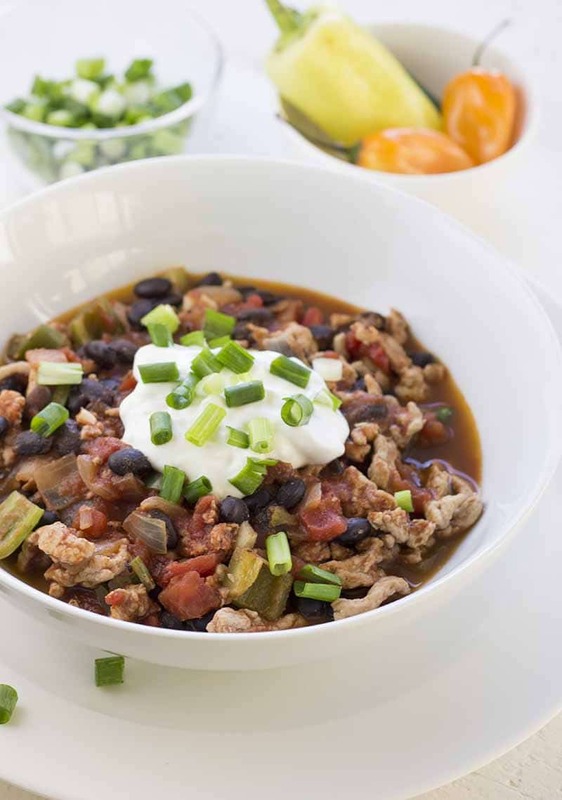 One of the things I always tell my diabetes coaching clients is the best diet for them is one that they will stick to consistently, and that includes having great go-to recipes like this Simple Turkey Chili. It will only take about 30 minutes of your time to make, so there is no excuse to call the pizza delivery guy after a long day of work. Save time by making Simple Turkey Chili before you need it! If anything, making this recipe ahead of time makes it taste even better. By making it ahead of time, the flavor “matures” a little, and you’ll have it ready when you need it. A win-win! It stores great in the fridge for at least three days, or you can choose to freeze it for a later date. By the way, Simple Turkey Chili tastes great cold! Although it gives you that comforting and cozy feeling when served warm, I also really like how it tastes when it’s served straight out of the fridge. Try it! Q: Why turkey chili? Is turkey better for you than beef? It’s naturally a lot leaner. You can get ground beef that’s almost as lean as ground turkey, but it doesn’t taste that great. Ground beef gets a lot of its flavor from the fat. At low fat percentages, turkey simply tastes better than beef. It’s less expensive, especially if you are buying organic. Q: Can I cook the brown beans myself? How do I do that? A: Absolutely! And I highly recommend it. It just takes a little more time and effort. You can see how to do it both the traditional way (where you soak the beans overnight before cooking) and in a much quicker way here. Q: I prefer a very low-carb diet. Can I reduce the carbs in this recipe? A: Yes, just take out all or most of the beans. That’s where most of the carbs are. Both of these recipes are amazing, so please check them out as well! When you’ve tried this Simple Turkey Chili, please don’t forget to let me know how you liked it and rate the recipe in the comments below! 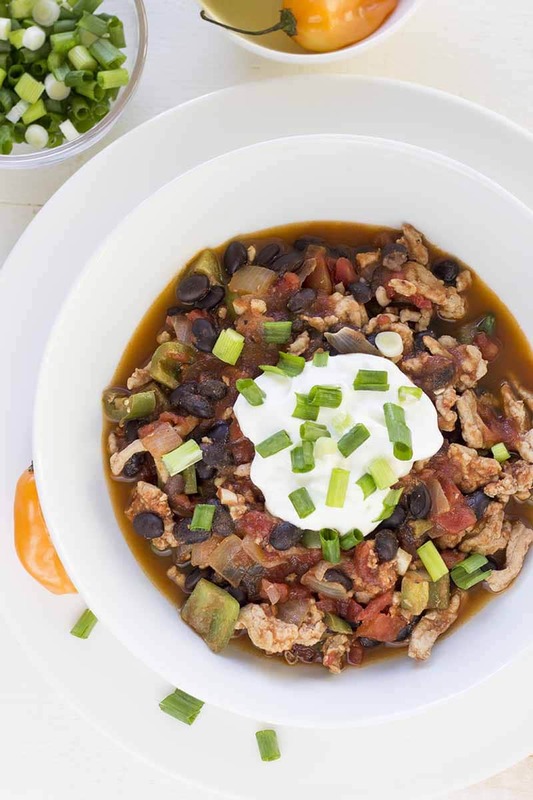 This Simple Turkey Chili is packed with protein and is one of my favorite go-to healthy chili recipes. Best of all, it's super easy to make! Chop Jalapeño, red chili, onion and garlic and sauté on a hot pan until the onions become translucent (about 3-4 minutes). If you want to reduce the heat of the chilies a little, you can remove the seeds. Add turkey to the pan, mix everything together and let it all cook for another 5 minutes. Add tomatoes, black beans, chicken stock and spices and let it simmer for 10-15 minutes. Serve with chopped green onion and sour cream on top. I made this for my mom who is Type 2 and she also needs to be on a renal diet. This has all the right ingredients to satisfy both. This recipe is so good! Really easy, will make.again! I loved this! So simple and easy to make. Thank you!